After Zhou Yu's death, Lu Meng becomes the main strategist for Wu. He acts as army's commander for He Fei and Fan Castle. 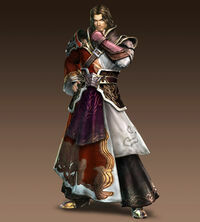 In the latter battle, he leads the Wu reinforcements and claims Guan Yu's life. He often suffers a mortal wound during the conflict and is succeeded by Lu Xun. Unless players are playing his own story, he will usually not appear after Fan Castle.